Citing everything from a shower scene as the sole high point by the overwhelming boys club of critics to an overly computer generated opening plane crash-- recently horrific reviews have likened Dominic Sena's latest film as being ideally suited for the common usage of the product that shares its title or have toyed with the movie's setting of Antarctica to describe it in terms of an avalanche of awfulness. 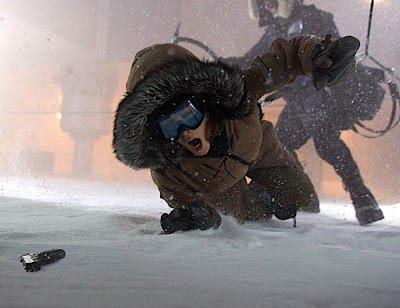 However, if you shovel beyond the surface level ice and strip down the layers of some plot contrivances and structural missteps that were piled on like the fifteen layers of clothing you would need to survive in that environment, you may be surprised to discover that Whiteout actually contains some pretty solid elements for what could've been a mighty little sleeper of a thriller. Working from Jon and Erich Hoeber's screenplay adaptation of the 1998 Eisner nominated graphic novel which was released in four installments by Oni Press from creators Greg Rucka and Steve Lieber, the movie bounces back from an admittedly video game like and possibly plot spoiling prologue of sorts after gunfire erupts on a Russian plane and they crash to the ground with the introduction of our strong, conflicted heroine. 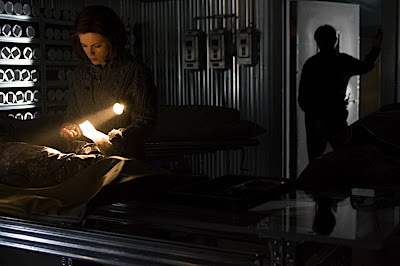 Played by Kate Beckinsale, we follow U.S. Marshal Carrie Stetko as she returns to the South Pole based American research station Amundsen-Scott and steps into that much discussed shower. While my heterosexual male colleagues checked out of critic mode temporarily, honestly Beckinsale's shower scene reveals about as much skin as an evening television program and is roughly on par with a shampoo or shower gel commercial. And as we later discover, getting acquainted with Carrie and another colleague in and around her bathroom does have a purpose. Instead of just passing it off as gratuitous, it does pay off later metaphorically as we're hit with brutal Memento influenced bathroom-set violent flashbacks of Carrie before she traded the continental U.S. for the solitary surrounding of miles of snow. Like an old cop movie cliche, she's just about to resign and return home when she and her closest ally Doc (Tom Skerritt) along with a refreshingly well-adjusted war veteran pilot Delfy (Columbus Short) discover an especially gruesome crime scene in the middle of the unforgiving landscape. With no tracks, climbing gear, or trace of the weapon, the Marshal who is used to dealing with misdemeanors becomes embroiled in Antarctica's first homicide. And while she and Doc briefly discuss just sending the body off to the next stop to analyze, Carrie realizes she can't abandon the reason she became an officer. As one body grows into multiple murders, an unidentifiable killer welding an ice axe chases Carrie Stetko as the movie morphs from "C.S.I. : Antarctica" to Dead Calm meets "Friday the 13th on Ice." And although I was able to guess the murderer among the tiny main ensemble cast of Beckinsale, Short, Skerritt, Gabriel Macht (as a UN sent investigator) and a few other inhabitants, the ultimate a-ha moment is rushed in the last twenty minutes in a ludicrous, dissatisfying finale with a run of the mill motive and weak showdown. 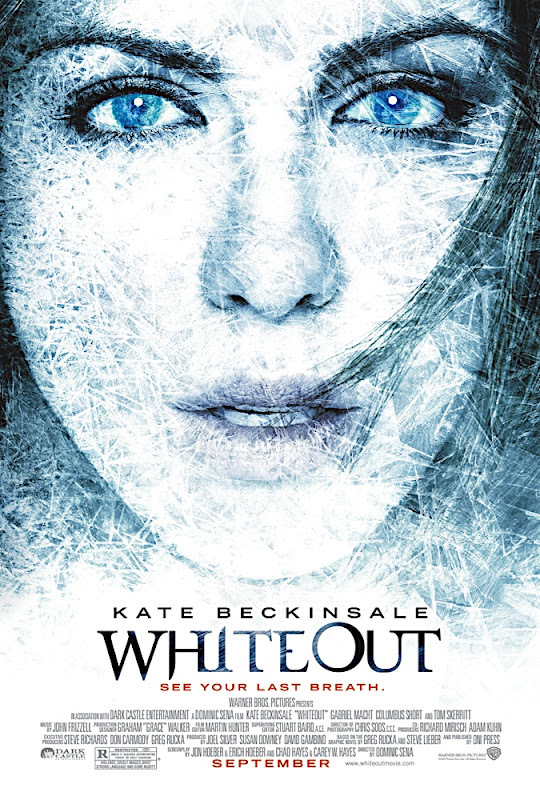 For instead of playing it as a straight mystery or a spooky thriller with another nail-biting chase pitting Carrie against the freezing temperatures and the murderer, Whiteout suffers unevenly with its cinematic hybrid and may also have been plagued with the daunting task of trying to cram four graphic novels into one roughly two hour movie. As such, Beckinsale's Carrie is the only character remotely fleshed out via the gritty flashback sequences that reveal her past and also given the partial bathroom setting and what took place offers you an immediate sense of whom the culprit will turn out to be in case you hadn't guessed in the opening act. Yet unfortunately she's never given a true opportunity to right the wrong of her past or the way she's been senselessly punishing herself for it since the Whiteout finale goes for a cop-out instead of a cop-on-the-case resolution. However, this being said, she fares much better than her male counterparts like Skerritt and Macht who are essentially playing "types" yet admirably Short's charm and humor give his character the most life and onscreen joy. While overall, producer Joel Silver's film is surprisingly better than most critics would have you believe and it's a damn sight more watchable than Smilla's Sense of Snow, I couldn't help wishing they would've taken Whiteout's strong building blocks and turned it into what for a moment seemed like a twenty-first century icy version of Dead Calm. And as a a writer who can't simply trash a film without trying to figure out what went wrong and how to rectify it, my brain was put into overdrive especially since female heroes are few and far between in Hollywood and I desperately wanted Beckinsale's film to be the brainy woman's answer to the junk usually hurled our direction. While I won't know precisely what the most crucial elements were without taking in the graphic novel, I felt that Whiteout could've been incredibly enhanced by possibly ditching the opening sequence to make the discovery of the plane far more surprising as well as giving our murderer a motive that's much more unique than a '60s style heist film from the plane's cold war era. Likewise by inserting more characters and red herrings, the filmmakers could've cashed in on the ultimate atmosphere of claustrophobia when Carrie and a small handful of colleagues (one of whom is the villain) are stuck there for the winter. And again by encouraging the writers to view films of varying success levels like Blair Witch Project, Panic Room, P2, The Mist, and Dead Calm to see how to make the most of "group-think" and having characters confined as evidenced in producer Joel Silver's Die Hard series, I know it would've gone from a relative C+ to a much more frightening, realistic and psychologically engrossing work. 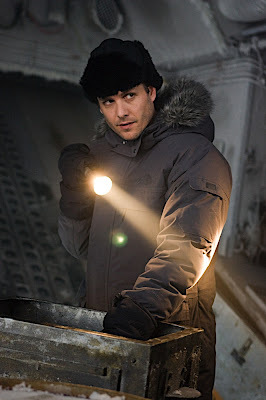 Although most reviewers have gone overboard in telling you to stay away as if the movie was on par with some of the true over-produced, silly with CGI works of the last year including Macht's beautiful bomb The Spirit, Watchmen, Quantum of Solace, and others, I'd still give it a cautious low recommendation. While it's definitely rental worthy for the gorgeous scenery also, it's also intriguing for writers to try and use the otherwise promise filled movie as a great creative exercise in analyzing just how it would've gone from an indecipherable blizzard to an intoxicating yet undeniably freaky frozen sensory feast.